You are at:Home»Industry»Research»CBRE: What’s New With Extended-Stay Hotels? Compared to upper-priced extended-stay hotels, the moderate-priced extended-stay sample has achieved greater CAGR gains in all major hotel performance metrics since 2010. CBRE: What’s New With Extended-Stay Hotels? NATIONAL REPORT—CBRE has released its latest analysis for the extended-stay hotel segment. When investing in hotels, recent year-over-year trends in revenues and profits, along with current performance values, are two of the metrics most frequently evaluated. Investors need to balance the current levels of a property’s occupancy, ADR, revenues and profits, with the recent direction of the changes in these measurements. In an attempt to time the market, some people prefer to invest in hotels that are currently achieving low levels of revenues and profits, but are coming out of the bottom of the cycle and achieving strong gains on the top and bottom lines. Others prefer hotels that have are approaching, or are achieving, peak levels of performance. When analyzing the performance of the extended-stay hotel segment, there is a difference in the performance of the upper-priced properties in this segment versus the moderate-priced properties. Since 2010, moderate-priced extended-stay hotels have shown greater gains in revenues and profits. However, upper-priced extended-stay hotels continue to achieve premiums in occupancy, ADR, revenues and profits. To evaluate the performance of extended-stay hotels in the U.S., operating data for a sample of 360 upper- and moderate-priced properties that submitted data each year from 2010 through 2017 to CBRE’s annual “Trends in the Hotel Industry” survey was analyzed. For this, the upper-priced sample consisted of hotels affiliated with extended-stay brands in the upscale segment. Moderate-priced extended-stay hotels are affiliated with brands in the upper-midscale and midscale segments. Economy 2 extended-stay hotels were excluded from this analysis to avoid a significant bias in the sample. Estimates of 2017 performance (2017E) were made based on the preliminary results of our 2018 Trends Survey. The following summarizes the findings of CBRE’s analysis. In aggregate, the properties in the extended-stay sample achieved compound annual growth rates (CAGR) of 4.8% in total operating revenue and 6.3% in gross operating profits (GOP) from 2010 through 2017. While strong, these growth rates are less than the 4.9% CAGR in revenue and 7.3% CAGR in profits achieved by the entire survey sample inclusive of all property types. Despite the slower historical growth rates, it is estimated that the extended-stay sample will continue to achieve significant premiums in both occupancy and profit margins compared to the overall sample. By capturing demand for five or more days, not only are occupancy premiums achieved, but so too are operational efficiencies. Fewer check-ins and checkouts, limited levels of housekeeping services, and a lack of retail food and beverage all lead to the 50.1% GOP margin estimated for the extended-stay hotel sample in 2017. 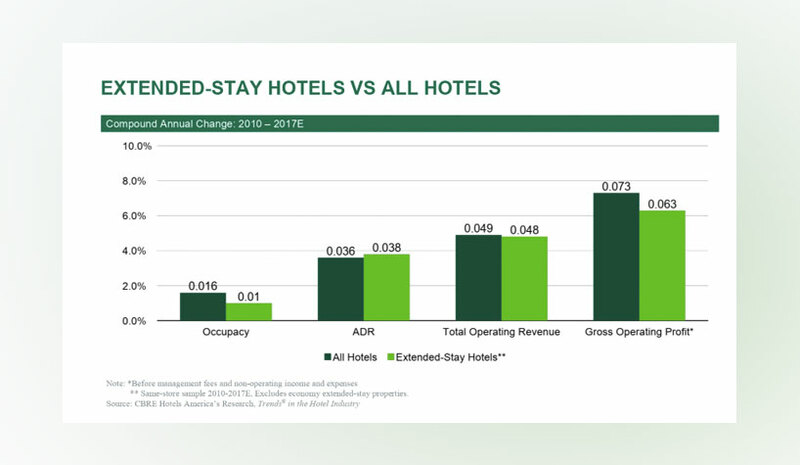 “Just as we observed differences between the historical performance of extended-stay hotels versus all other property types, we have also seen operating differences between upper-priced and moderate-priced extended-stay hotels,” said Robert Mandelbaum, director of research information services at CBRE Hotels’ Americas Research. Also contributing to the superior profit growth for the moderate-priced properties was greater control over expenses. From 2010 to 2017, labor costs per-occupied-room at the moderate-priced sample grew by a CAGR of 1.7% compared to 2.6% for the upper-priced sample. 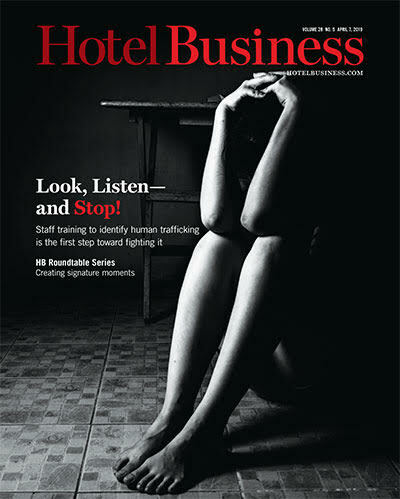 Moderate-priced extended-stay hotels operate on very limited staffing levels, and typically offer housekeeping services just once a week. Being mostly fixed in nature, labor costs at the moderate-priced extended-stay hotels do not necessarily react in sync with fluctuations in occupancy. By achieving a 62% premium in ADR ($146.84 vs $90.56), the upper-priced properties in the sample were enabled to achieve a 69% premium in total operating revenue per-available-room (PAR) during 2017. The greater dollars in revenue also led to a 72.9% enhancement in GOP PAR ($22,408 vs $12,959). Accounting for the inherent differences in dollars PAR, upper-priced extended-stay hotels also achieved a premium in profit margin. In 2017, the upper-priced sample achieved an estimated GOP margin of 50.3% of total operating revenue. This compares favorably to the 49.2% GOP margin at the moderate-priced properties. While staffing levels are lower at the moderate-priced properties, the higher revenue levels at the upper-priced properties covers the greater labor costs and results in a labor cost ratio 0.5% less than the moderate-priced sample. In the March 2018 edition of Hotel Horizons, CBRE is forecasting the demand for U.S. hotels to increase by approximately 2% each year through 2022. This implies that economic indicators such as income and employment will continue to remain healthy and generate lodging demand. Given the corporate orientation of most extended-stay demand, this bodes well for the extended-stay lodging segment, according to the company.